"Ensuring memorable & safe experiences for all onboard & paying forward what we learn securing the future of sport fishing & our environment." An exciting way to experience Jacksonville, FL fishing! 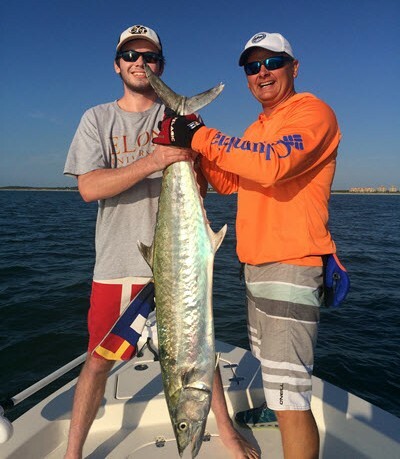 Whether you're a family seeking memorable moments, novice angler looking for something fun to do or an experienced fisherman in need of a safe and experienced boat charter, Fish Whisperer Charters has you covered. Located in Jacksonville, Florida, our fully insured & U.S. Coast Guard licensed captain will ensure your fishing charter meets or exceeds your expectations. Our charters also extend beyond fishing, so review our page, pick one or a hybrid and give us a call to get it started! Fish Whisperer Charters, LLC was created with the novice fisherman and family quality time in mind while also working to fulfill the desires of the experienced angler. At the helm of Fish Whisperer Charters is Captain Kris Kell, a USCG Licensed, fully insured, & seasoned mariner with over 20 years of experience as a U.S. Navy officer and 15 years fishing the Jacksonville area waters. We especially want to reach out and offer our services to our military brothers and sisters, understanding first-hand how important enjoyable downtime is between separations. Contact us and let's set something up! You DESERVE it. Families/novice/experienced anglers, our mission is simple: "Ensure a memorable & safe experience for all onboard & pay forward what we learn securing the future of the sport & our environment."